To get to the Blue Stack Mountain lakes requires mostly a walk or even a long walk. An angler attempting to fish here should be reasonably fit. Let’s have a general look at Donegal and the Blue Stack Mountains first. The County is by far the most rugged and mountainous in Ulster, the northern province of Ireland. Donegal reaches from Inishowen and wild Malin Head landscapes, the most northerly of the island, down to Ballyshannon and Bundoran with its Drumlins, the gentle rolling lowland hills. 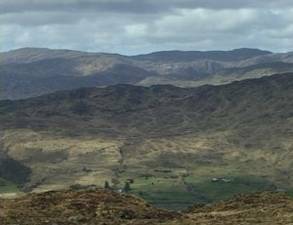 The more famous “Hills of Donegal” consist of two ranges: the Derryveagh Mountains in the north of the county, and the Blue Stack Mountains in South Donegal. Dietrich Bohnhorst with a nice one. The highest peaks just short of 700 meters, the Blue Stacks cannot be compared to the Alps or Pyrenees or Ardennes. The distances from Binbane and Glenties in the west to Ballybofey in the east and from Letterbarra and Barnesmore in the south to Commeen in the north render them a pretty small range. Let’s say about 35 kilometres long and 15 wide. Nevertheless, 147 mountaintops or “Stacks” have been counted. Ray Robinson with a Blue Stack Mountain brown trout. There are of course, apart from the many lakes, countless little streams, brooks and rivers. 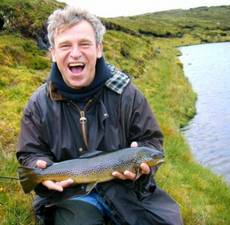 Some of them grow later into famous angling rivers, like the Finn, Eany, Eske and Owenea. For more Information on the Blue Stacks visit our DIARY section.